In a parallel universe where all our comparisons fit in a tweet, this one would probably say "Just get the Galaxy Note 8", followed by a bunch of hashtags and emoji. 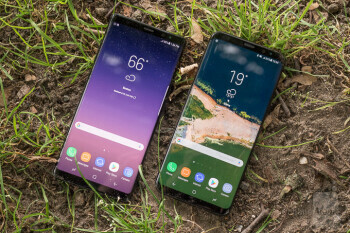 But in the current, we take a much more in-depth approach to our 1v1 articles, even when one of the phones is clearly superior to the other, as is the case here. 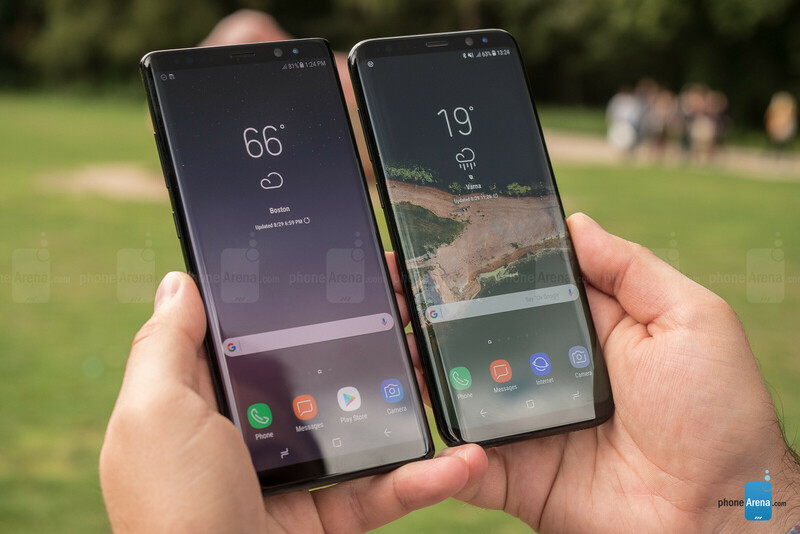 Both the Samsung Galaxy Note 8 and the Galaxy S8+ are big and powerful, attractive in appearance, and loaded with more software goodies than you'll ever have the need for. But only the Note 8 has a dual camera -- one enabling bokeh effects and providing real 2x zoom. And only the Note 8 has the S Pen digital stylus for note-taking, drawing, and image editing. This makes it the obvious choice, but is it really the better pick once we take pricing into account? Let's dive in and find out. When it comes to looks and feel, the Galaxy Note 8 and the Galaxy S8+ tick lots of the right boxes. Their so-called Infinity Displays -- with minimal bezels and occupying nearly all of their front sides -- give them a futuristic look, while the glass-and-metal construction has “premium” written all over it. But when it comes to feel in the hand, the curved corners give the S8+ a slight advantage ahead of the boxier Note 8. 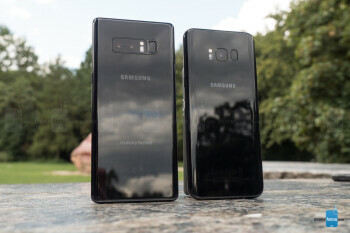 In case there’s any doubt, both handsets are humongous, but if you weren’t okay with this, chances are you wouldn’t be reading this comparison in the first place. 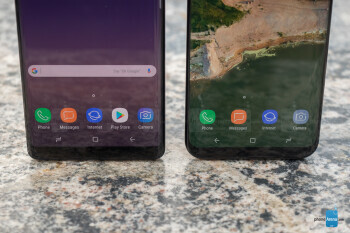 Alas, there are downsides to the Infinity Design approach, and it’s not just the higher odds of cracking the Note 8 or the S8+ if you drop it. Both phones have their fingerprint scanners placed at an odd, offset position at the back, where they’re trickier to hit without looking. On the topic of durability, it is great that both phones come with IP68 water resistance, as any proper high-end _phone_ should. That extends to the S Pen on the Note 8, meaning that you’re free to jot down notes in the swimming pool like a boss. 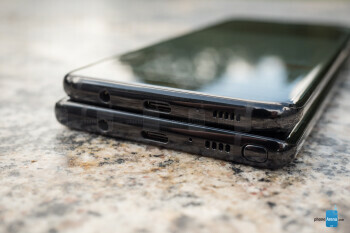 Looking around the sides of both handsets, you’ll find the usual volume and power buttons, as you’d expect. Samsung has also added a button dedicated to activating Bixby, its own virtual assistant. Too bad that the button is not programmable, and pressing it by accident is not impossible as it is placed opposite to the power button on the other side. 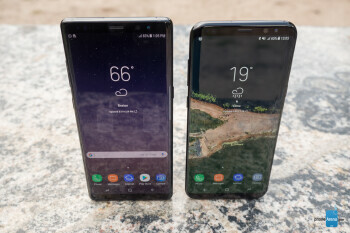 Neither of these two phones will disappoint you when it comes to screen quality. 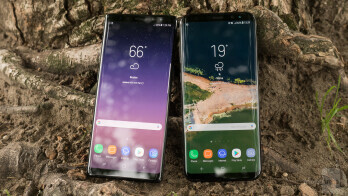 The Galaxy S8+ and Galaxy Note 8 have bright and vivid AMOLED displays that pack the same high number of pixels for superb detail in images -- 1440 by 2960 of them, to be more precise. Both run at 1080p resolution by default, however, to save battery. That is perfectly sufficient for most people, but if you feel like squeezing every bit of detail these can produce, you can switch to maximum resolution from the display settings. Speaking of settings, Samsung is offering you various display modes to experiment with. Again, most folks would be fine with the default Adaptive Display mode, but color accuracy is greater in Basic mode. As the Galaxy S8+, the Galaxy Note 8 excels when it comes to outdoor visibility. Night Mode -- a blue light filter that makes the screen go easy on the eyes in the dark -- is also on board. 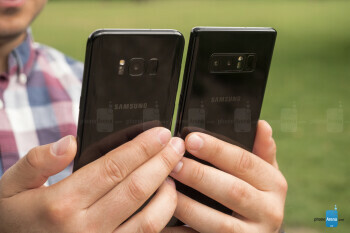 Samsung’s familiar Always-on Display mode is active on both phones by default, so you can easily check on the time or see if you have pending notifications without turning the _phone_ on. HDR videos can be enjoyed on both devices, streamed from Netflix or even YouTube. On the topic of durability, it is great that both phones come with IP68 water resistance, as any proper high-end phone should. That extends to the S Pen on the Note 8, meaning that you’re free to jot down notes in the swimming pool like a boss. Samsung’s familiar Always-on Display mode is active on both phones by default, so you can easily check on the time or see if you have pending notifications without turning the phone on. HDR videos can be enjoyed on both devices, streamed from Netflix or even YouTube. Here’s where things get a bit more interesting. 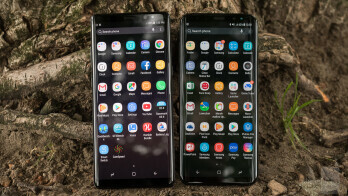 On the surface, the Galaxy Note 8 and Galaxy S8+ seem practically identical in terms of software, as they both run Samsung’s latest interface on top of Android Nougat. But only the Note 8 has the S Pen, which unlocks a whole new layer of interaction with the device. This is a fancy way of saying that you can hand-draw images, write or annotate on photos or documents, and navigate through the UI using Samsung’s advanced digital stylus, which the S8+ does not support. Of course, the Galaxy S8+ does not feel underpowered without an S Pen, so its lack isn’t a big deal. But an S Pen sure is nice having – it boosts the productivity potential of the Note 8, it is fun to play with, and it is always at your disposal. S Pen aside, the Galaxy S8+ and Note 8 can do a lot of tricks equally well. Both let you customize the on-screen navigation buttons, so you can rearrange them to your liking. Both support user interface themes. Both support face recognition and iris scanning as alternatives to a fingerprint reading (although a finger scan still seems most convenient). Both come with Bixby – Samsung’s virtual assistant. And the list of things both have in common goes on. One minor difference between the two is in the way side-by-side multitasking works. On the Galaxy Note 8, you may create your app pairs – presets that you launch from the Edge Panel with a single tap, which is very handy if you find yourself multitasking often. And when it comes to multitasking, these two phones are great at it thanks to the spacious display and its proportions. Samsung’s UI can perfectly fit the messaging app, the on-screen keyboard, and a YouTube video all on the same screen. There’s no need to go into details here, as the Samsung Galaxy Note 8 and the Galaxy S8+ are equally powerful for the most part. Both are equipped with a Snapdragon 835, or with a just-as-capable Exynos chip in certain regions. That’s the top silicon you can get right now, so there’s nothing we can complain about – the two are perfectly capable of handling any heavy app or game you throw at them. We must mention that the Galaxy Note 8 comes with 6GB of RAM as opposed to 4GB of RAM on the Galaxy S8+. In theory, this would allow it to store more app data for quick use, thus improving how quickly apps launch and how swiftly you switch between them. In practice, we can’t see much of a difference on a day-to-day basis -- both phones will keep over a dozen recent apps in memory for quick access. But performance also depends on what apps you run and how you have your phone configured. In any case, the Note 8 is more suitable for heavy users, not to mention that it is the more future-proof of the two. Storage starts at 64GB natively, which is the norm nowadays for the phones of this class. This is enough to hold plenty of photos and 4K video, but those requiring even more space can throw in a microSD card on either handset. The dual camera at the back is a key selling point for the Samsung Galaxy Note 8. The approach taken is very similar to what the iPhone 7 Plus has – a main 12MP camera suitable for any situation is paired with a 2X zoom telephoto camera that brings your subject closer without sacrificing quality. It also enables background blur effects (simulated bokeh) to be applied to the image to make your subject stand out better. Here's our Galaxy Note 8 vs iPhone 7 Plus portrait comparison to give you an idea what these look like. On the Galaxy S8+ there’s only a single 12MP camera that is identical on a hardware level to the Note 8’s main one. Since the Galaxy S8+ only has a single main camera, you won’t find a Live Focus mode in its camera app. There’s no 2X zoom button either. But these are the only major difference you’ll encounter. Both camera apps are rich in modes and controls you can play with, while the settings you’re less likely to adjust more than once are tucked away in a separate Settings menu. The whole UI is a bit cryptic at first, but you do get the hang of it eventually. 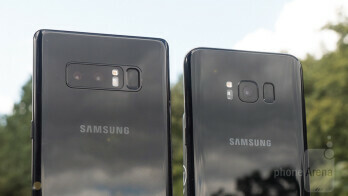 Knowing that the Galaxy S8+ and Galaxy Note 8 had identical camera hardware, we were a bit surprised to see that image quality was actually better on the latter. It all comes down to camera software, it seems – while the Galaxy S8+ sharpens images rather aggressively, the Galaxy Note 8 goes easier on the sharpening. That is why if you zoom in on the images out of the Note 8, you’ll see less of a halo around edges. And that’s a good thing as fine details may suffer due to oversharpening on the S8+. That aside, both phones seem to behave in a typical for a Samsung device manner. The cameras take great pictures overall, be it in daytime or in low light, but their tendency to boost saturation in certain scenes is quite obvious. In some situations, a little extra pop could help, but with others, excessively vivid colors may spoil the view, making it unnatural in appearance. To no surprise, the Galaxy Note 8 produces better detail in images where zoom has been used. The difference is not dramatic, but it is very obvious and much appreciated, especially in daytime images. Keep in mind that the Note 8’s 2X zoom cam is not usable in situations with very low light due to technical limitations, but even in moderately lit scenes, its superiority over digital zoom on the S8+ is easy to spot. Both phones have the same 8MP front-facing camera with autofocus, and the quality of its images is pretty good, even in low light. HDR selfies are supported, and the screen can go off at full brightness when illumination is required. We can’t see much of a difference in selfie quality – both phones perform equally well. Both phones shoot video in resolutions up to 4K, which produces rich, detailed footage when you have enough light to work with. Here the Note 8’s dual camera comes in handy as its 2X zoom abilities produce a much clearer image compared to the digital zoom on the S8+. Auto-focusing is fast as usual. One curious detail: sound in the Note 8’s videos is a tad clearer, with more presence in the higher frequencies. Buying a phone at this price point comes with its perks. In this case, you get a pair of AKG earphones in the box with every Galaxy S8+ and Galaxy Note 8. While not perfect, especially from an audiophile’s standpoint, these are much better than the typical headset that you’d get with most other phones. Read more about them in our in-depth review here. Both phones have a single bottom-firing speaker producing sound at decent loudness and of acceptable quality. Its an okay speaker – nothing more, nothing less – and it appears to perform identically on both devices. If you enjoy watching video on your mobile device, you’ll love the Galaxy Note 8 and Galaxy S8+. With their large, bright, quality displays, both are ideal for enjoying anything from a YouTube video to a favorite Netflix series when no larger screen is around. Both support HDR video content streaming from Netflix, and just recently, HDR video on YouTube became playable on both Galaxies. Because yes, phones are still used for making good old-fashioned calls. 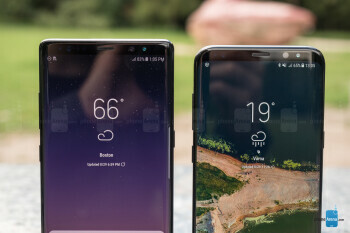 In this case, the Galaxy Note 8 and Galaxy S8+ do an okay job. They don’t shine with anything in particular, but they’re not bad either, with decent output on both ends. Here’s one of the rare instances where the Galaxy S8+ stands taller, albeit not by much. It holds a bigger battery -- one providing 3500mAh worth of charge, while the Note 8 has a 6% smaller, 3300mAh cell. As expected, the Galaxy S8+ achieves a higher score when put through our custom battery benchmark. But at the end of the day, the gap in endurance is negligible. Both phones should be able to last you at least a day of moderate use, depending on how you have them configured. Disabling the Always On Display feature, for instance, should result in noticeable power savings. And when the time comes to plug them in, the Galaxy Note 8 and Galaxy S8+ will recharge at rapid speeds. As long as you use their stock charger or a compatible replacement, that is. Fast wireless charging is a go with both. 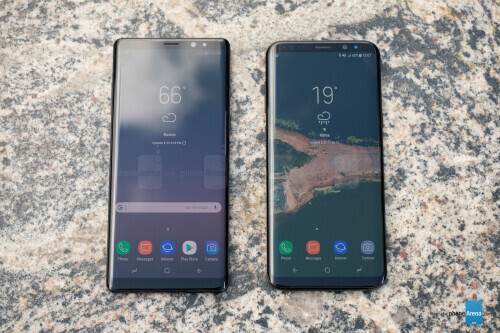 When we started working on this comparison, we expected no surprises whatsoever given the similarities between the two phones and the obvious advantages the Samsung Galaxy Note 8 has over the Samsung Galaxy S8+. Our expectations were spot on. 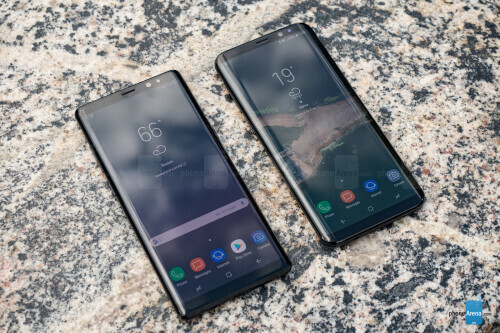 Equipped with an S Pen and a camera superior in many ways, the Galaxy Note 8 is clearly the better pick, while the Galaxy S8+’s bigger battery would deliver only marginally longer battery life. But what about pricing? Well, it is true that the Galaxy Note 8 is more expensive, priced at $930 at carriers, retailers, and on Samsung’s own website. But the Galaxy S8+ costs $830 already, so dropping the extra $100 on a Note 8 is totally worth it. When you take the freebies into account, the Note 8 becomes even more worthy of your attention. Right now, buying one gets you a free Gear 360 camera or a wireless charging pad and 128GB microSD card combo.